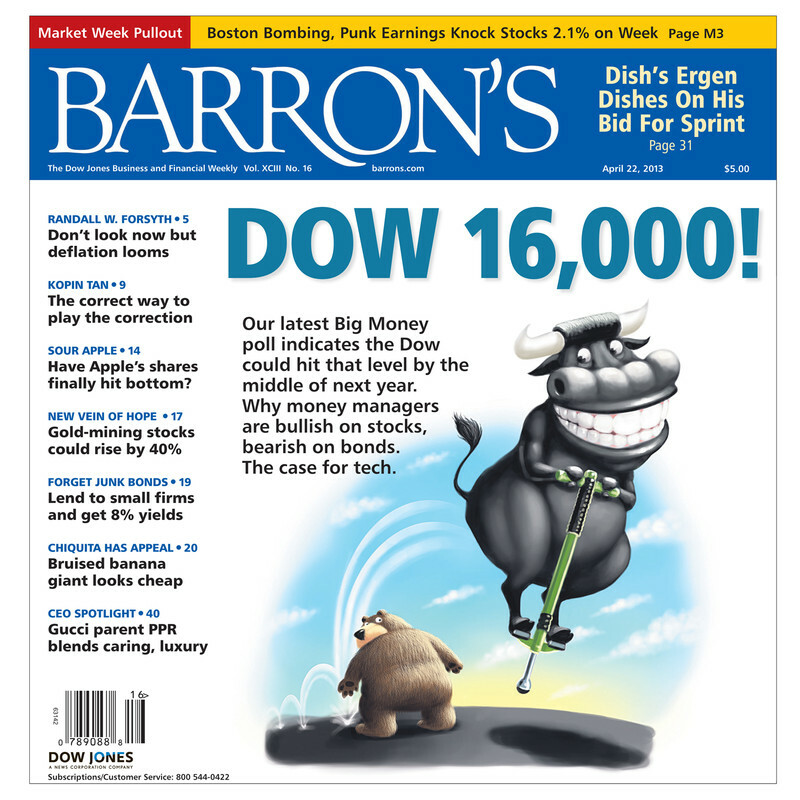 This weekend's Barron's Magazine cover features the exclamatory prediction of "Dow 16000!" and depicts a bull (replete with a huge Cheshire cat grin) on a pogo stick bouncing over a fat, slow, and apparently confused bear. Clearly, the message this cover wishes to convey is: "Have another margarita, bulls! There's nothing at all to worry about!" Barron's has a bit of history with bullish magazine covers, and it isn't terribly encouraging. There are some logical reasons that publications such as Barron's sometimes make great contrarian indicators, and I'll cover these in a moment. Unlike my column (and many other columns here on Minyanville), publications like Barron's are generally more focused on reporting the past than they are on predicting the future. This is not to imply any kind of slight against them, or that there's anything wrong with news-based publications -- we have to get our news from somewhere. To be honest, sometimes I'm envious: Writing about the past allows an infinitely higher degree of certainty -- and involves a lot less head-scratching, fewer sleepless nights, and virtually no potential for "getting one wrong" (or criticism about the same, for that matter). As Yogi Berra once said, "It's tough to make predictions, especially about the future." Interestingly, Barron's Big Money Poll in May of 2007 was also quite bullish in tone, and predicted Dow 14,000 -- and that prediction was featured on the cover in a similar way in 2007. This level wasn't actually too far off, and was reached in October 2007 after a rally of about 6%. We all know what happened after that. The bullish cover of 2007 was a whole lot closer to the top than it was to the bottom. When market publications which usually stick to reporting the past decide instead to predict the future, there is somewhat of an intrinsic "conflict of interest." Barron's didn't become hugely popular by publishing stuff nobody wants to read -- so by the time they're willing to boldly predict something on the cover, it's at least partially because they feel that cover will make the majority of people want to buy their magazine. Bears obviously don't want to read an article about "Dow 16,000!" People who own equities do. This tells us, in a roundabout way, that "bullish" has gone very mainstream -- and in this way, these types of magazine covers help indicate when sentiment levels are approaching extremes. The problem, and I've written about this many times, is that by the time everyone "knows" something about the market, it's usually dead wrong. When we're talking about bullishness, there are only so many buyers out there -- and it obviously takes a constant influx of new buyers in order for any stock to continue heading higher. Even if a stock were the Greatest Most Amazing Stock in the World (just as a "totally random example," let's say this amazing stock were, ahem, Apple (AAPL)), once everyone who wants to own Apple already owns it, then at that point, the share price has nowhere to go but down. Think of it like an auction where -- unbeknownst to the buyers ahead of time -- there will be 50 of the exact same item auctioned off sequentially, one at a time. Further imagine that no one at this auction knows in advance that there are only a total of 49 buyers present for this particular item. In this situation, the first few times the item comes up, the bidding will be hot and heavy since the majority of buyers are still competing with each other. This drives the bid higher each time, and, more importantly, establishes a psychology of "fair market value" for the item in everyone's minds. Since the price is continually being bid higher anyway, each subsequent auction then commences with a higher starting bid, and the buyers naturally take no issue with this. There will continue to be some degree of competitive bidding, and accordant price increases, right up until the second-last buyer (buyer number 48) secures his item. Then, with no more buying competition, buyer number 49 will simply pay the high starting bid -- and for a brief moment, this last buyer will actually think he got a "really good deal" because no one bid the item any higher. But trouble starts (seemingly out of nowhere) when the auctioneer tries to sell item number 50, because suddenly nobody wants it at the opening bid. He lowers the asking price -- but still, no buyers. What no one there realizes just yet is that all the potential buyers have already been converted into "owners," so there's simply no one left who's interested in the remaining inventory. The auctioneer looks around in surprise, and drops the price again, but still no buyers step forward. And now a new kind of trouble begins, because at that point, all the people who just bought this item feel like idiots. They're not "happy owners" anymore -- in fact, now they're thinking they probably paid way too much! The feeling that we got "ripped off" -- or that we own something nobody else wants (especially an "investment" nobody wants!) -- brings up strong emotions. These emotions can be exceptionally powerful when it comes to the markets, because emotions in that arena are tied to our sense of financial security, which in turn is tied to our deepest, most primal instincts for survival (none of us can survive for long without any financial resources!). As a result, when the above analogized situation occurs in the stock market, it can actually generate an outright selling panic. The panic psychology is further compounded by the fact that equities have absolutely no practical use whatsoever in the physical world. You're essentially buying a really fancy piece of paper, solely because you're hoping you can sell it to someone else for more than you paid for it. This "greater fool" psychology makes the stock market much more emotion-driven and volatile than the markets for most physical items. In any case, once a "no more buyers" situation is reached, the asking price will have to continue dropping until such a point as either new buyers find the lowered price attractive, or previous sellers find it attractive once again, at which point a new price floor can be established. Do note that I'm not predicting a selling panic tomorrow, I'm merely noting that the sentiment precursors are in place, and a 20-year high in bullishness shouldn't be ignored. Since I always try to see both sides of the argument, though, I think it's also important to note that these types of sentiment indicators are purely relative, and that makes them difficult to time trades with. For example, I remember some contrarian investors talking about what a great time it was to buy equities in 2008 when the polls came in showing bears numbered around 60%. They said it again when bears numbered 65%, and again at 70%, and again at 75%... and so on. The market didn't end up bottoming until bears numbered over 90% -- so the key takeaway is that numbers which look extreme this week can end up looking mild by comparison in a month or two. Moving on to the charts, I continue to feel it's more likely that this is a reaction rally and that bears will take the market back down again after it's over. 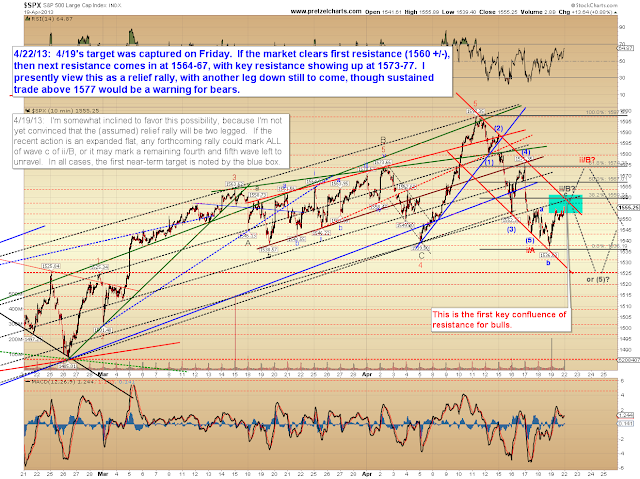 The 10 minute chart shown second has a bit more detail about upcoming resistance levels. It's worth mentioning that last Tuesday's projection (reprinted in the red breakout box below) has played out exceptionally well since. Hitting three turns in advance on a "best guess" isn't too bad -- especially considering SPX traversed more than 80 points during that time, and the market's now right back to almost exactly where it started (!). That projection correctly anticipated about 85% of the move in terms of points captured, as well as the correct turning points -- so if you traded that roadmap, then you probably did okay. Hope it helped anyway! We'll see if the original roadmap continues to track or if Friday's slightly altered view comes to pass. On Friday, while I (correctly) projected the rally into the blue target box, I also slightly favored the idea that would mark the end of the upwards correction. I noted that I didn't feel I could see "two turns down the road" at the moment, and what would happen after that rally wasn't entirely clear to me. After studying the charts over the weekend, it does appear there may be some additional upside momentum left, so I've noted the next resistance levels on the chart below. In conclusion, last week I outlined a number of reasons why it appeared that bears were gaining control of the market, and I presently continue to feel that the current rally will ultimately stall and be sold. 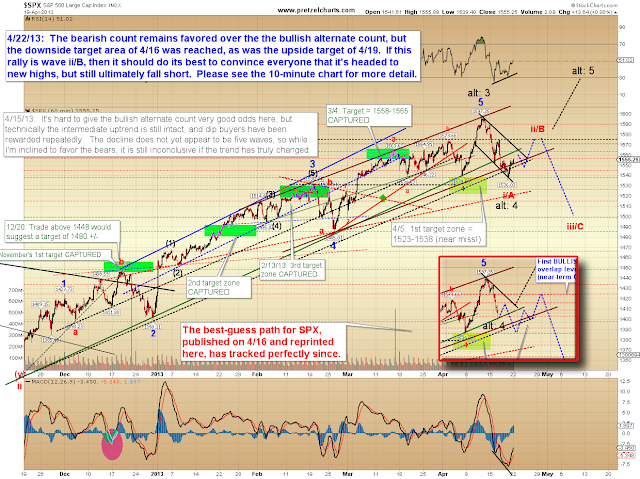 The preferred wave count shows this as a higher degree wave ii/B, which means that sentiment should remain bullish throughout this rally, and it will do its best to convince us it's headed to new highs. At this point, sustained trade above 1577 would indeed call the bear view into question. Trade safe. What's up, I check your new stuff on a regular basis. Your story-telling style is awesome, keep up the good work!